Do you ever struggle with what the Bible reveals to you? With all these many events which are hard to get your mind around. Like all these miracles. Many Christians have struggled with them. It was the famous writer Mark Twain who said that “It ain’t those parts of the Bible that I can’t understand that bother me, it is the parts that I do understand.” Can you relate to that? It’s true. We struggle. We often struggle especially with those events in the Bible that are clearly described. Words are clear. They are easy to understand. But the reality that they describe are hard to grasp. Like today, – walking on the sea. Or the last Sunday, the feeding of the thousands. When we read these testimonies of eyewitnesses, we often picture Jesus as they saw Him, as one of us, – and this is what sometimes makes it hard to comprehend some of these events. But who was this Jesus? We just said it in our confession of faith, in Luther’s explanation of the 2nd article of the Apostles’ Creed. I believe that Jesus is true … God and that He is also true … man. Sorry, which of them? Both at the same time. How can this be? How are we supposed to comprehend it? The last week we reflected on Jesus healing many and then on top of that feeding the thousands in the desert. With five loaves and two fish! Do you remember, who else did something similar? Who else fed multitudes when they were traveling through the desert? We have it recorded in the book of Exodus. Yes, it was the gracious God Yahweh Himself. So, what does the feeding of the thousands by Jesus tell us? Who was, who is this Jesus? Aren’t these events loud and clear in their message? This wasn’t the first time when He demonstrated His powers over the forces of creation. 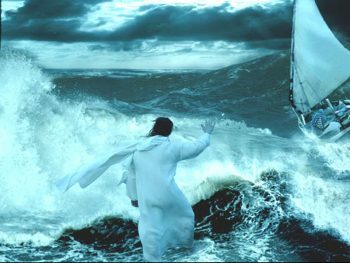 Earlier we can read about Jesus silencing the storm that threatened to sink their boat. Jesus was exhausted after healing many, and was dead tired asleep in the boat, when His disciple stressed woke Him up. Who else had the same powers? To command the sea and the winds and, generally, the laws of creation? Again, we find it recorded in the book of Exodus. That was God Yahweh. The creator of heaven and earth. But, we are very much like the disciples of Jesus. Even if they were together with Jesus, they still feared many things. We do too. They were worried about many things. Whenever they faced something where they didn’t know what to do, wherever they were not in control, they were worried, they were frightened. They were just like us. We are worried about many things, too. For we often are not in control either. What do you fear about? What may happen after the coming plebiscite? What will happen after the coming synod? What will happen with our church, with our congregations? How will I pay my bills? What happens if I won’t have my income? How can I help my loved ones who are terminally sick, or who have lost someone? How will I live without people who mean so much to me? How can we protect our children from this ever-degrading world? How can we pass on our faith? There are so many things to worry about. What are you worried about? What do you fear? Whatever it is, this event with Jesus walking on the sea is recorded for your sake, to bring you a great comfort, to strengthen your faith, to strengthen your trust in our Lord. To assure us again and again about Jesus’ identity and what it means for us. He was and is true man, and He was and is true God. Matthew has recorded the words of Jesus after His resurrection, which are as clear and as comforting as they could be. “All authority in heaven and on earth has been given to me.” (Mat 28:18). All authority! Not only over sicknesses. Not only over demons. Not only over wind or sea or water. Not only over the small and great problems of this world. Over everything, even over life and death, – all authority has been given to Jesus. He is in charge. He is in control. Everything belongs to Him. Sometimes we, Christians, may be afraid facing hostility from this world. Guys, we don’t live in enemy’s territory. We shouldn’t be afraid, we shouldn’t worry, for it is Jesus Christ, who has received all authority. He is your God. Think about the disciples’ experience! Early morning, just before the dawn, you are in the middle of the sea, wind is strong, and waves are big. And then you see someone in darkness walking on the sea. Not the most peaceful picture, right? Is that a ghost? No, it’s Jesus. How often we are in situations where waves of this life seem to be too high, and winds too strong, and there is only darkness around, and Jesus seems to be too small, just like one of us. Then remember this event. It doesn’t matter how strong or how weak your faith is. We all are only children of little faith. What matters is that our faith is in Jesus. For He is the strong One. Regardless of His appearance in our human form. He is the Almighty One! There is no reason to doubt His abilities. He will hold you whatever happens. But it is also comforting to remember that Jesus is also true man, one of us. He is not only the wholly other, the all-powerful, the eternal, the incomprehensible. He is one of us. He understands us. He has experienced every bit of human existence. He knows what our lives in this age are like. He knows and understands all our struggles, all our worries. He understands them, and He cares for each one of you. Thus, we have these two pictures, the almighty One and the gentle One, so different, but at the same time inseparably united in this one man, Jesus from Nazareth, our kind and loving Lord. There is one last thing I wanted to mention. Our Christian story doesn’t end with simply Jesus being true God and true man. Remember, what Isaiah recorded, – God is doing a new thing in Jesus. A marvelous thing. Not only Jesus was true God and true man, but in Jesus from Nazareth divinity and humanity are inseparably joined together. What does this mean for us? That in Jesus God has accomplished, what Luther called ‘the wonderful exchange’. In Jesus Christ God took what belongs to fallen humanity, and in exchange gives us what belongs to divinity. He took our sinfulness, our mortality, our fears and worries, and in exchange He gives His holiness, eternal life, peace and joy. In Jesus, He gives all these wonderful gifts to humanity. To everyone whom the Holy Spirit has united with Jesus. He gives these wonderful gifts to you. See, we not only have the all-powerful God and Protector, we not only have the God and Savior who understands us and holds us, we also have this generous and loving God, who desires to share His abundance with us. Everything that He has, He wants to share with you. We may be perplexed reading the Bible. We may struggle to comprehend how all of this could have happened. We may be of little faith, when we struggle and fear and worry. That’s fine. That’s fine. For you have Jesus, true God and true man, He is in control, He knows you, He has chosen you, He has claimed you, He cares for you, and He will never ever abandon you. Fear not you of little faith. He will hold you until we see Him. ← Why Dying Churches Die?